Helping children live healthy and vibrant lives every single day! At The Wellness Path, we are passionate about helping children experience the optimal health that comes with having a properly functioning nervous system. Chiropractic care is a safe, natural and effective way to help your child experience optimal health now and into their adult years. If you’ve been looking for a chiropractor for kids, you’ve come to the right place! We care for children of all ages and will tailor treatment to each child’s individual needs. One big advantage of starting care at an early age is that kids’ bodies work faster so results are quicker and they experience wellness sooner than an adult. Improve breathing difficulties like Asthma, Allergies, etc. Rest assured that Dr. Vic and Dr. Beau, both Pediatric Chiropractors, use very light force techniques to adjust their pediatric practice members. When caring for infants, they will perform a functional neurology check to determine if an adjustment is needed. If there is a subluxation at C1, they will use their pinky to make the adjustment. The amount of force that is applied is the same as the amount of force you would put on your eye when it is closed and press until you feel the pressure. 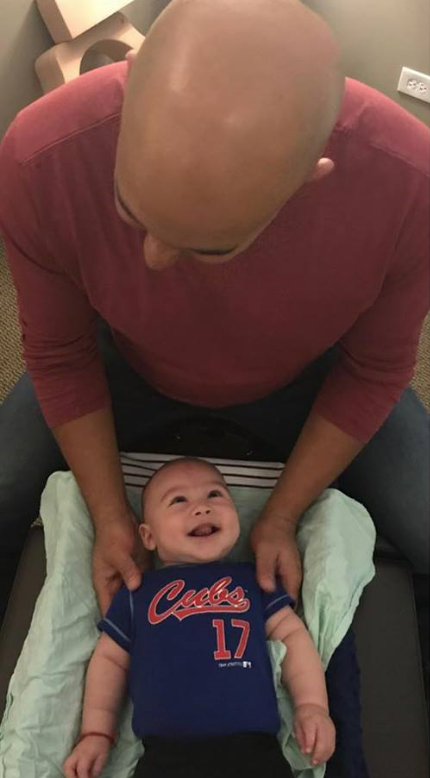 Starting around 7-8 months, when an infant does not like being on their back anymore, the Chiropractors at The Wellness Path will perform their adjustments using the Torque Release Integrator adjusting tool. They will walk you and your child through every single step of the adjustment process. Whether your child is suffering from a chronic condition such as asthma or allergies or has autism or ADHD or just making sure your child is growing and developing the way they are designed to, we want to positively alter their course so they can live the best quality of life possible. Through chiropractic care, Dr. Vic was able to overcome numerous childhood health challenges including sinus infections, scoliosis, chronic strep throat and more. Help your child enjoy optimal health and wellness with safe and natural chiropractic care. Contact us today to schedule an appointment!